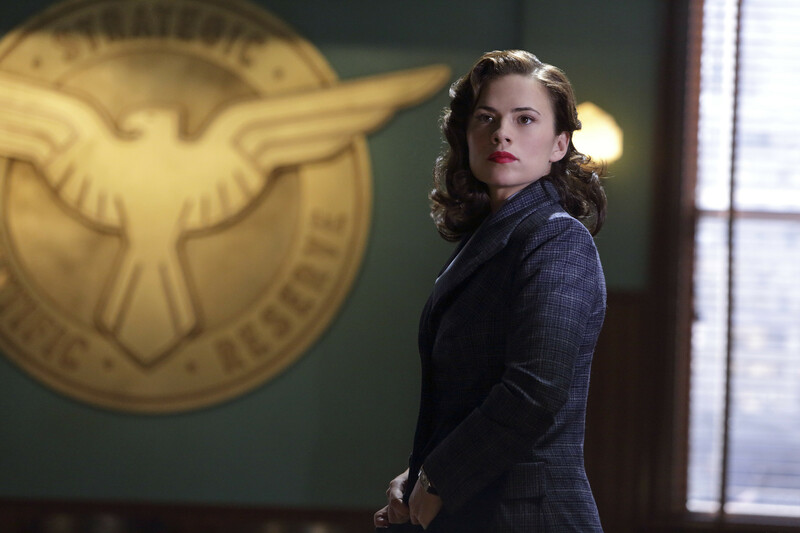 In my Going Vintage post, I mentioned that one of my current role models is Agent Peggy Carter played by the lovely and talented Hayley Atwell. One of the things I absolutely love about Peggy is her sense of style. Since I’ve been attempting to go more vintage in my wardrobe, what better way to get inspiration than to start with Peggy. So I have plans to make her iconic blue suit but I am having difficulty finding the appropriate blue color fabric in the right texture. I also have plans to make some of her Captain America uniforms but some of the pieces do not exactly translate to a teacher’s wardrobe. 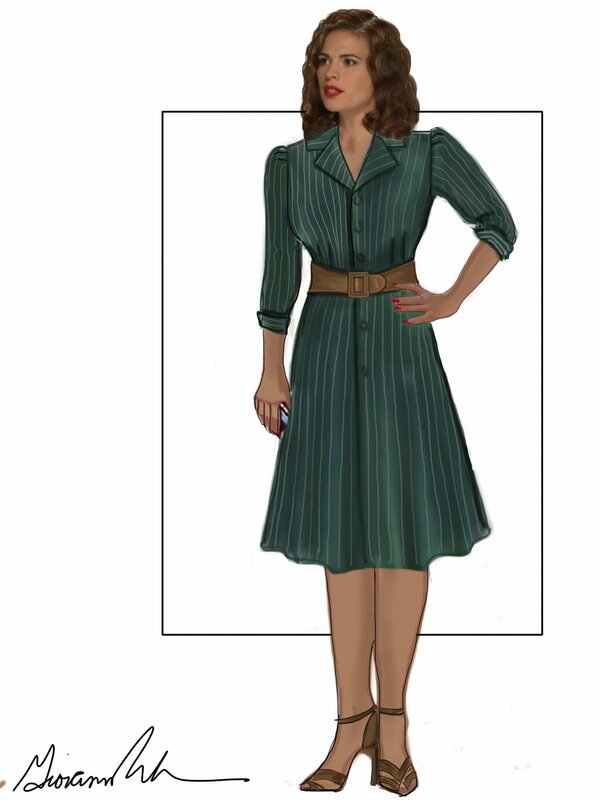 Since I love many of her pieces from Marvel’s Agent Carter, it just made sense to reproduce similar pieces. A lot of Peggy’s pieces were either actual vintage pieces or custom made for the show. Other than the shoes and make up, there’s no way I’m going to be able to acquire screen accurate pieces. So the challenge would be to make them as close as possible. Challenge accepted! One of the pieces I really love is her blue and red dress she wears midway through the first episode. This is one of my favorite pieces from the series and probably the closest to what I currently have in my wardrobe. I am fairly certain the original was made is a polyester type fabric but I plan to make mine in scuba knit for stretchability. While the second is a dark blue stripe with a brighter toned blue belt. The two outfits seem to use the same dark blue pants and shoes but the jackets, shirts, and belts change. They looked so similar with shirts having similar collar structures that I originally thought they were the same outfit. I’m more partial to the blue plaid one so that’s the jacket I’m likely to make first. Speaking of plaid jackets, her red plaid jacket from the end of Time and Tide is just gorgeous and eye catching. The costume designers of the show have stated that her skirt here is brown, but I think a dark navy would be more appropriate and work just as well. Her green wrap dress coat from the Iron Ceiling is also a favorite. The skirt has a nice swing to it. 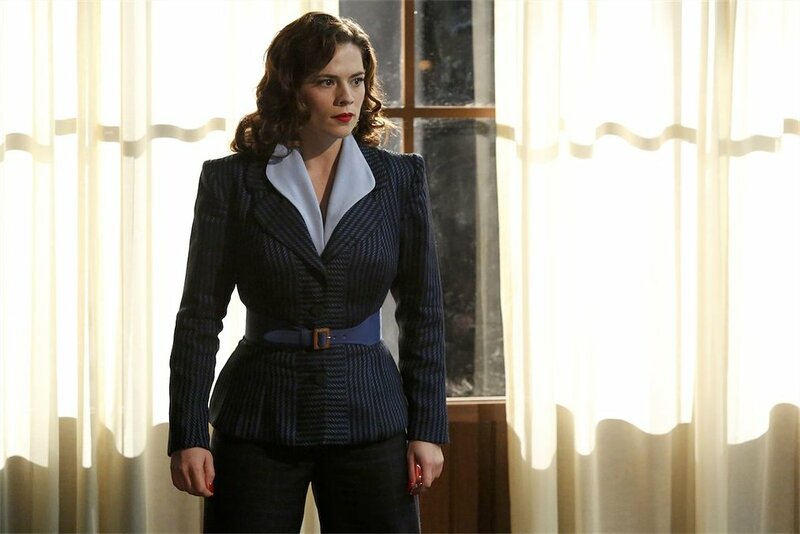 I think this is one of the few non-red, white, and blue outfits Peggy wears but I still love it. Wrap dresses work for almost any body type, especially my pear shaped figure. There is of course her vintage blue and pink dress from the interview at the Griffith scene. This is going to be an interesting challenge getting those pink stripes to line up. Of course Peggy also has a number of silk shirts. I can think of at least five different styles she wears, most of them made of silk. Silk is expensive these days so I will probably use it only sparingly, making most of the shirts out of polyester, shirting, or poplin. The upside of making so many shirts is I will have plenty to wear for work. Last but not least is the red dress from the bar scene in Captain America. I have no idea when this dress will be worn but it’s nonetheless beautiful and I want it. This entry was posted in Cosplay, Marvel, Sewing and Crafts and tagged agent carter, agent carter cosplay, clothing, cosplay, marvel, marvel cosplay, peggy carter, peggy carter cosplay, sewing, wardrobe. Bookmark the permalink.